Phanteks has become known to create novel cases. Our Munkys have visited their suite at CES and found two new cases on show. The first is the Project 916, a dual system full tower case. It sports 5mm thick aluminium panels that curve around the front of the case in what reminds us of the Silverstone TJ07. The front panel, that is a perfect canvas for a modder, contains two 5.25” drive bays and enough space to hold a 560mm radiator. The whole case has ventilation between the circumference of the case and the beginning of the side panel. This allows all the fans to draw air in without having massive holes in the front. We think we’ve spotted what looks like milled fan grills on the top. It looks like there could be room for a 360mm or maybe 480mm radiator. This would have to assume there is an additional support structure for the radiator and fans as only 4 screw holes can be seen. The side panels are made entirely of tempered glass, something that more and more manufacturers are moving to instead of acrylic/Perspex. The panels have relatively small accents of mesh and brushed black aluminium and the Phanteks logo. We are sure the Munkys will give us more information on this case when they have finished running around! 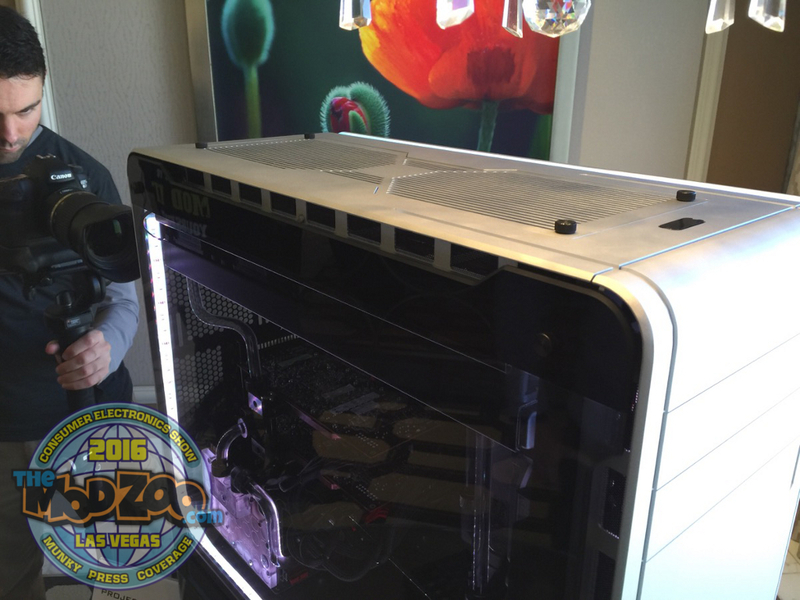 The second case on show at the Phanteks booth, was the Evolv ATX. We’ve seen the Evolv ATX before, however this time we see it with tempered glass panels. Keep watching this space to see more detailed and continued coverage from CES 2016!